You are currently browsing the archive for the Soil Research Centre category. Over 160 female scientists will take their science to the streets of 13 UK cities across England, Wales and Scotland this summer for the Soapbox Science Festival. Now in its sixth year, Soapbox Science challenges perceptions of who a scientist is by celebrating diversity in women in science. On Saturday June 18th Soapbox Science will be making its debut in Oxford. From 2-5pm, 12 incredible female scientists will be taking to their Soapboxes on Cornmarket Street to share their passion for science with the public. Soapbox Science Oxford will feature many fascinating talks which will give the public an insight into how science is tackling a diverse range of issues, from helping us fight tooth decay, to saving elephants in Mali, discussing whether nuclear energy is green or even what a teabag can tell us about soil! In the UK, women account for 35 per cent of PhD science graduates, but only 11 per cent of senior lecturers and less than 8 per cent of professors. The UK has an annual shortfall in domestic supply of around 40,000 new STEM skilled workers. One solution is to retain the women currently being lost from science. Implicit bias – an unconscious cognitive phenomenon where we negatively assess a person’s ability – is also driving the loss of women scientists. Both men and women can be guilty of implicit gender bias: for example, pilots are generally thought of as being men and nurses as women. Recent studies show that implicit bias is a big problem among scientists and the public alike. For example, academic employers rank CVs with a female name lower than identical CVs with a male name. In applications for science funding, women need to be 2.5 times as productive as men to receive the same ‘competence score’. The public believe that the explanation for the so-called ‘leaky pipeline’ (a metaphor for the continuous loss of women in STEM as they climb the career ladder) is that females ‘lack ability’ to be high-level scientists. The 2016 Soapbox Science festival challenges these perceptions of who a scientist is by celebrating the diverse backgrounds of women scientists, with speakers from several different nationalities, speakers who started their scientific careers late in life and speakers with disabilities. Last year, Soapbox Science events reached over 30,000 members of the public, with feedback showing they not only enjoyed it – they plan to come again. Events are open to the public, free of charge, and great fun. Expect hands-on props, experiments and specimens, not to mention bags of passion and enthusiasm. Dr. Irina Velsko, University of Oxford. Brushing away the film – clearing confusion for cleaner mouths and healthier lives. BSc Environmental Science students Valentin Meneveau and Jennifer Lam present posters at the Undergraduate Research Opportunities Programme (UROP) conference. 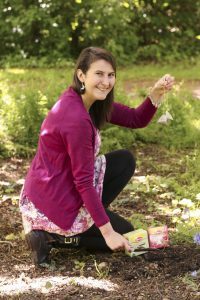 Jennifer’s research worked to improve the resistance and resilience of soils to extreme flooding events. She discovered that by diversifying farming practices, soils could resist disturbances to a greater extent. Valentin’s project investigated the genetic basis for arsenic accumulation in the leaves of vegetable plants and was able to identify specific genes that allowed the vegetables to resist elevated levels of arsenic in the soil. UROP provides exciting opportunities for undergraduates to work with staff on research projects across the University, contributing directly to the creation of knowledge, building new skills and strengthening the link between teaching and research. The UROP scheme gives undergraduate students in the middle years of their degree* the chance to work on real research projects alongside academic researchers, contributing to the creation of knowledge. UROP placements last six weeks over the summer break and are paid- students receive a bursary of £1,320. 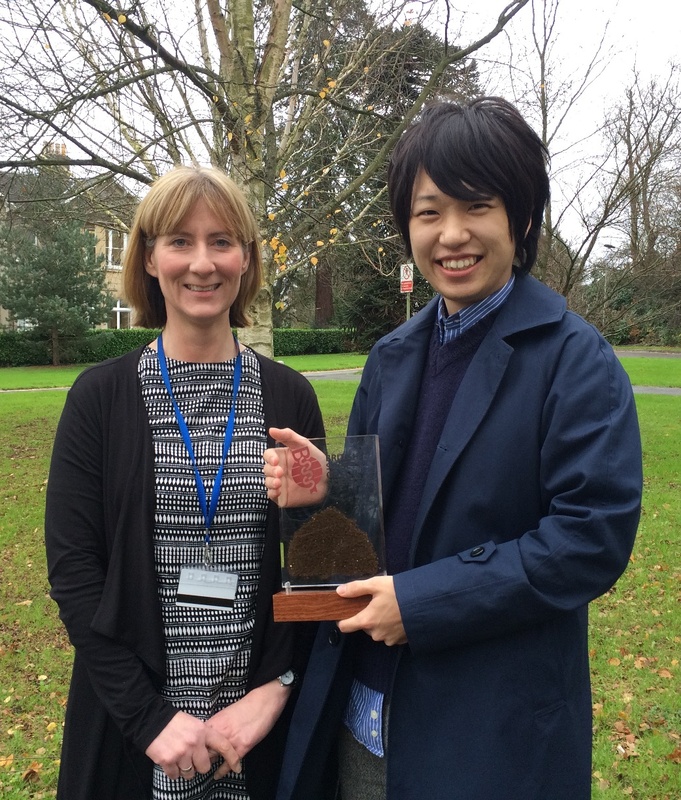 Congratulations to Jumpei Fukumasu for winning the 2015 BSSS MSc Dissertation Award for his dissertation on ‘Is there a stronger relationship between N-acquiring extracellular enzyme activity and nitrogen mineralization in disaggregated soils than in aggregated soils?’, supervised by Dr Liz Shaw (presenting the award). Excellent work, Jumpei! Competition this year was particularly tough, with many excellent nominations from students who achieved a distinction in their dissertation module. Well done to all our students for their fantastic research. We wish all of them the best of luck with their future career and thank them for their hard work and dedicated whilst at Reading. SRC Photo Competition Winners 2015! 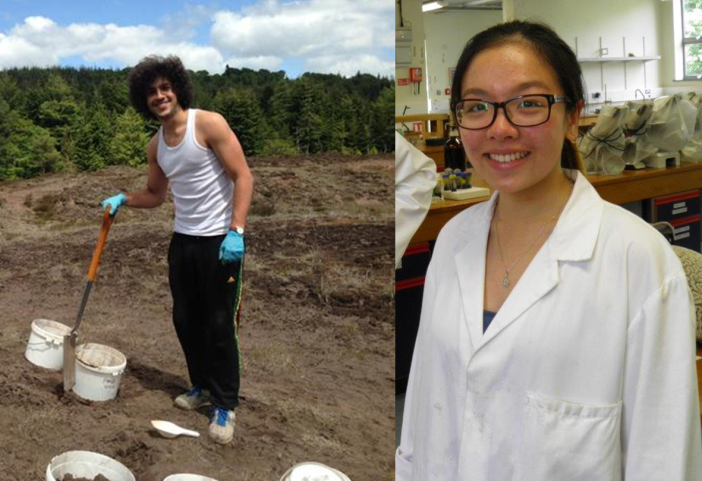 Congratulations to the winners of the annual Soil Research Centre Photo Competition! We had a fantastic range of entries this year, which you can view at the album here. 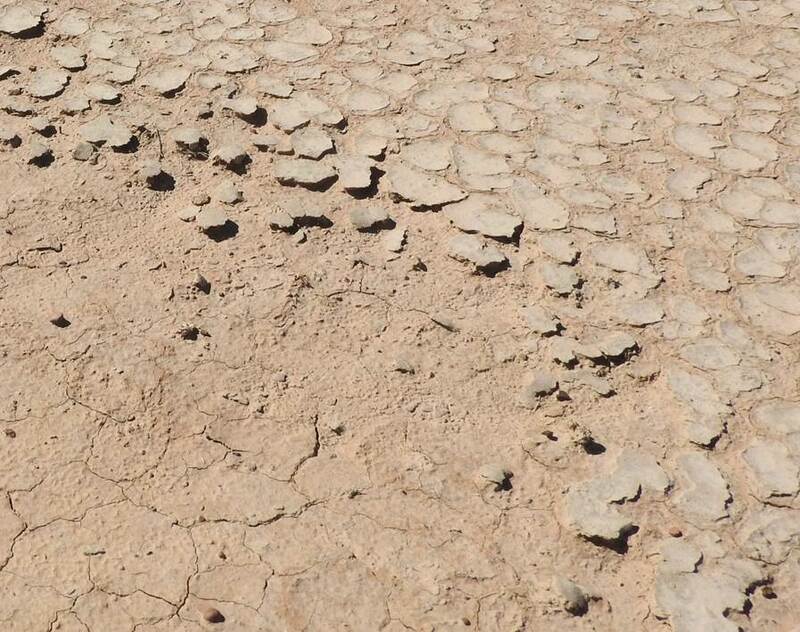 Ian Davenport: In arid and semi-arid regions, cyanobacteria use light and water to grow filaments that bind soil particles together, forming a crust that helps to prevent erosion. Photo from Diamantina, Australia. As soon as you enter the House of Commons you get a buzz. There are lots of people engaged in conversation and the sense of being at the centre of government is palpable. The further you enter into the myriad of rooms you can understand the huge expense that will be involved in any refurbishment. We are in committee room 19, but there are many other meetings indicated on the display boards and you realise the difficulty any campaign will have making an impact. The presentations go down really well; I focus on the biological variability of soils and the problems of establishing robust soil health indicators as well as introducing the Soil Security Programme. Jack Hennan from Cranfield University describes the physical variability of soils and the limitations of national monitoring. The final speaker is Helen Browning from the Soil Association who presents seven ways we can improve soils. After drinks about twenty of us have a sit down dinner and Stephen Metcalfe MP the Chairman of the Parliamentary and Science Committee opens the debate ‘Are we looking after our soil’. After 30 minutes of vigorous conversation where a number of soil threats are highlighted (e.g. growing unsuitable crops such as maize, the problems of sustainable management associated with short term tenancies), we search for a single action to recommend. A commitment to increase organic matter in arable fields by 20% is proposed by Helen Browning. While we can all see pitfalls in this we recognise it as a clear ambition that will have a beneficial outcome. We’re looking for a Research Fellow in Soil Biodiversity to join our team – check out the link for more information on the role and details on how to apply! 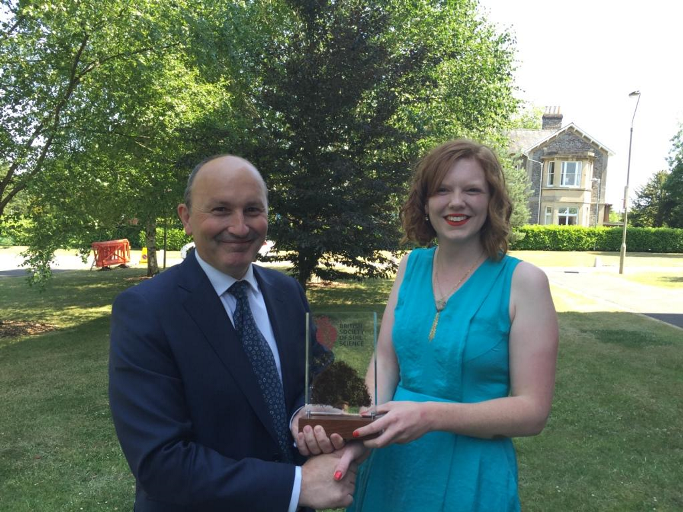 Congratulations to Rosie Everett, winner of the 2015 BSc BSSS Dissertation Prize for her project on ‘Reconstructing Late Würm Late-Glacial and Early Holocene environmental changes in the Corsican uplands and evaluating the response of human groups to climate change and vegetation succession’ supervised by Dr Nick Branch (presenting the award). Rosie’s project used the sedimentary records from Lake Creno, Corsica as an archive for past environmental conditions. She analysed the pollen stored in the sediment to reconstruct past conditions to see if there was a relationship between past climate during ate Wurm Late Glacial and Early Holocene period and human settlement on Corsica. She has been putting her paleoecological skills to practice as a Forensic Researcher Intern at the James Hutton Institute, looking at rates of recovery of diatoms, taken from lake samples from pig liver tissues, as an analogue from human drowning cases. Rosie graduated this summer with a BA in Archaelogy, and is currently working with a forensics company, assisting with field work. 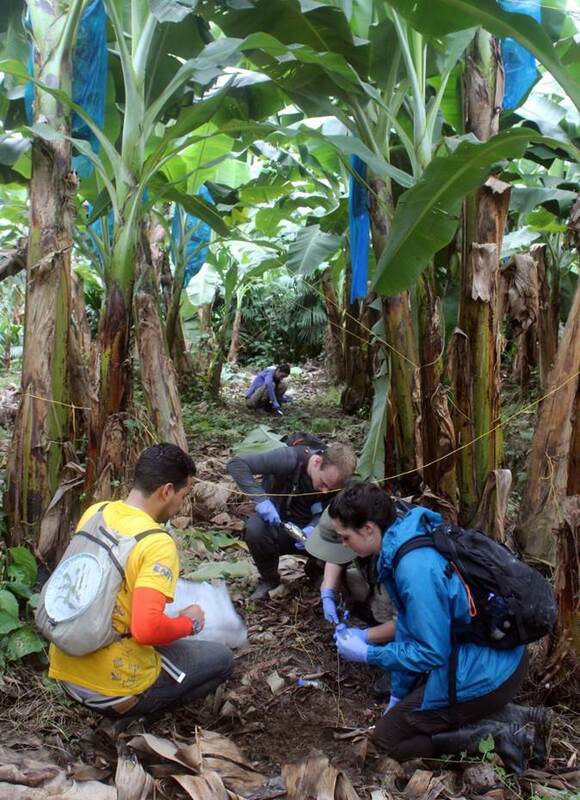 Her ambition is to build on this experience and skills base to pursue post-graduate study in ecology. We’re extremely proud of Rosie and all our students’ fantastic achievements this year. Competition for the prize this year was tough with many strong entries. We wish everyone from the Class of 2015 the best of luck with their future endeavours. 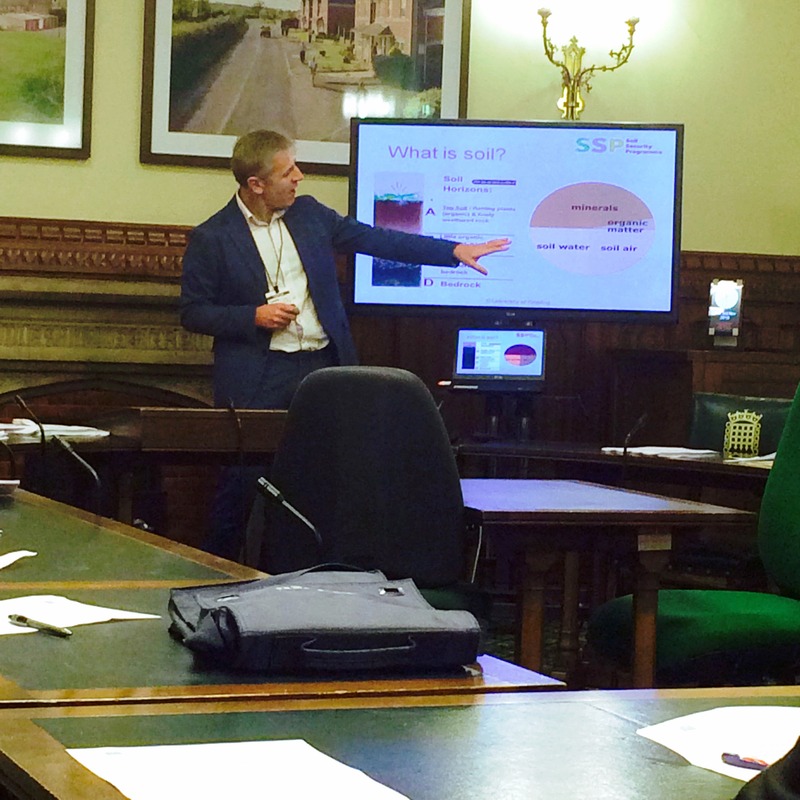 Professor Chris Collins and Dr Tom Sizmur gave presentations to a workshop on Soil Health and Management at Imperial College. The event marked the launch of the Inaugural Sainsbury’s Farming Scholars programme. 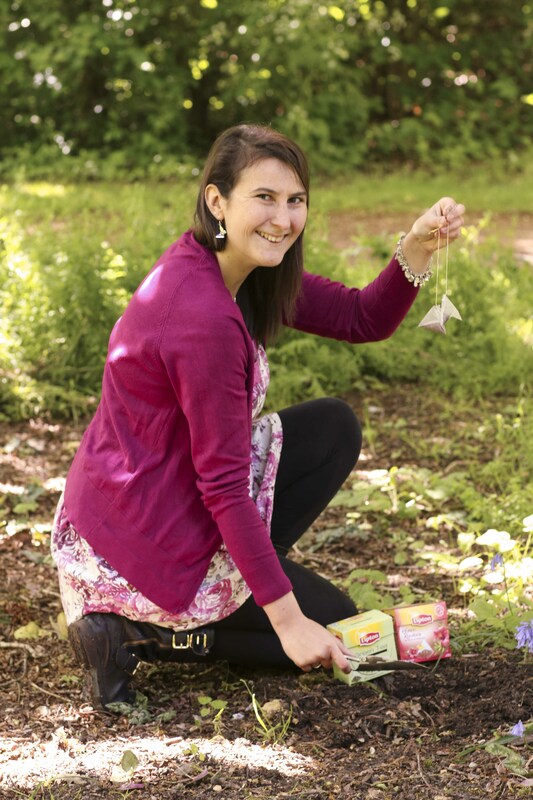 The Farming Scholars are representatives of growers that supply Sainsbury’s and are motivated to apply the latest scientific evidence to improving the sustainability of their operations and manage their soils more effectively. Tom Sizmur introduced some preliminary data from a suite of experiments at Rothamsted Research that he worked on as a postdoctoral researcher. The experiments reveal that the addition of organic matter to soils can rapidly increase earthworm number and biomass in soils. 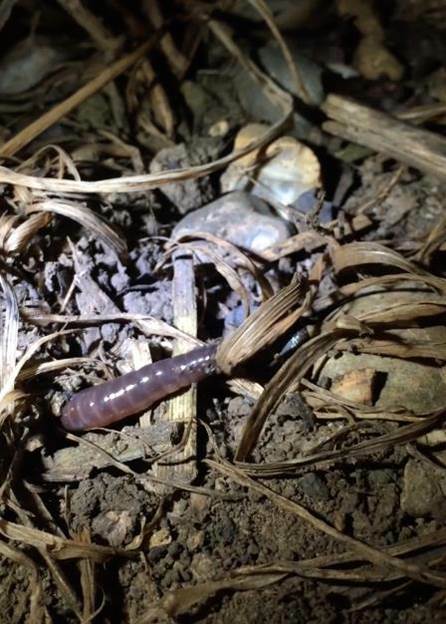 The earthworms break-up, incorporate and mix the organic materials into the soil. This is essentially a form of ‘biological cultivation’ which improves the structure of the soil, via the formation of aggregates and connected pore networks. He revealed that the structure of the soil was modified by the presence of earthworm burrows which makes it easier for plant roots to penetrate and for water to infiltrate. The larger, deeper root network that resulted from ‘biological cultivation’ increased the yield of cereal crops. On Tuesday 10th February Dr. Tom Sizmur met with growers in Essex and Hertfordshire at Manuden Village Community Centre to talk about how soil structure and crop yield can be improved by adding organic matter to soils and boosting earthworm populations. Tom presented results from a suite of field experiments designed to demonstrate that cereal crop yield could be improved by adding organic matter to soils because the organic matter acts as a food source for earthworms. Research was carried out in collaboration with Rothamsted Research. 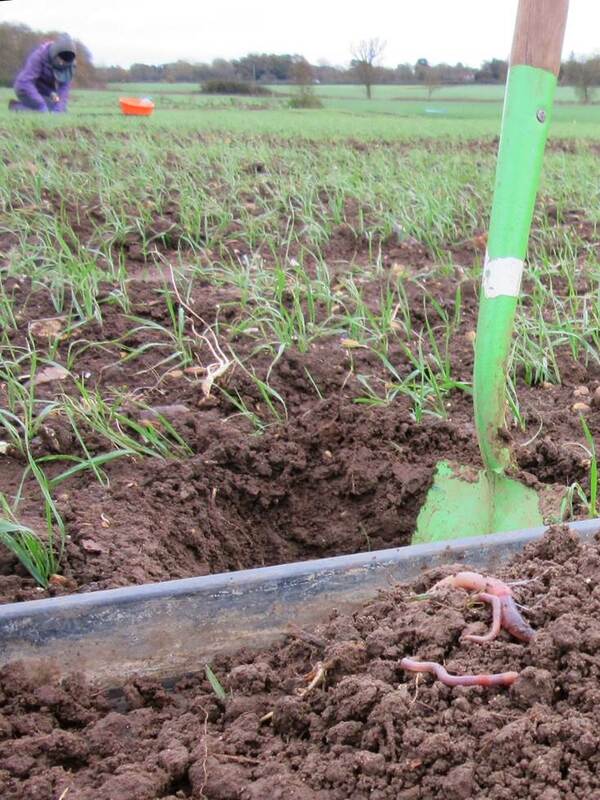 The earthworms reduce the strength of the soil and provide a medium that enables plant roots to establish faster. 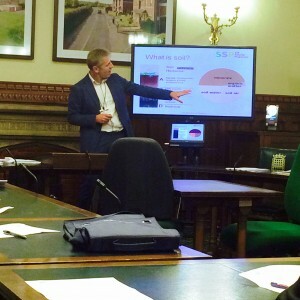 This presentation was part of an ongoing contribution to a suite of workshops delivered by the Soil and Water Management Centre in partnership with Natural England’s Catchment Sensitive Farming Programme. The workshop was introduced by Sarah Asberry, the Catchment Sensitive Farming Officer for the Mimshall Brook, Upper Roding and Upper Lee & Stort catchments. Other topics covered included soil biology and health by Professor Karl Ritz of Nottingham University, and cover crops from agronomist Nick Green of T Denne & Sons.